my first Kiss concert: The first time I saw Kiss was in Buenos Aires, Argentina, September 3rd 1994. The photo you can see here was taken on a airplane, the day me and a friend traveled to Buenos Aires to see the Psycho Circus show in Buenos Aires, April 10th 1999 (this photo was taken the day before, April 9th 1999). I already met Kiss in person: Almost, THIS CLOSE!!!!!!! favourite album: Each One Of Them Has Their Own Gems. 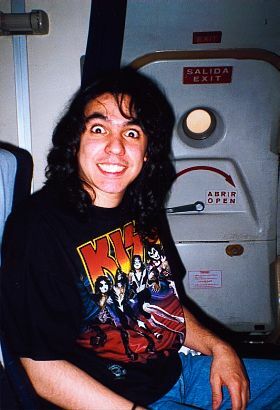 my Kiss-story: There's some... like when I was waiting for Gene outside of the Hotel (1999) and when he finally came out he get into the Combi with the windows open... everyone went over it and start to ask him for a signature. When I decided to do the same, I said to him "Gene, please, the last one", that was when the F***** Combi drive start to move on, and Gene opened his arms to me like saying "Sorry, we're goin´to shoping, maybe later...". My legs were shaking, I was really frustrated... but it was cool. In 1994 we could have the chance to meet Paul when he was gettin' out of the Hotel to say hello, but the argentine fans were so crazy that he didn´t do it 'cos he was afraid to anybody get hurt.